Farfisa O.R. 200 Tube Amplifier + OR 100 412 Cabinets on ebay! Take a look at this! A brand new monster Farfisa OR200 Amp and speaker set. The price is pretty steep, but this is a complete set up and is NOS! The Gibson Sabre Reverb Amplifier was sold as the Farfisa Amp at the dawn of Farfisa’s presence in the United States. Since both Gibson and Farfisa were owned by CMI, the Chicago Musical Instrument company in Lincolnwood, Illinois, there were a lot of crossover. 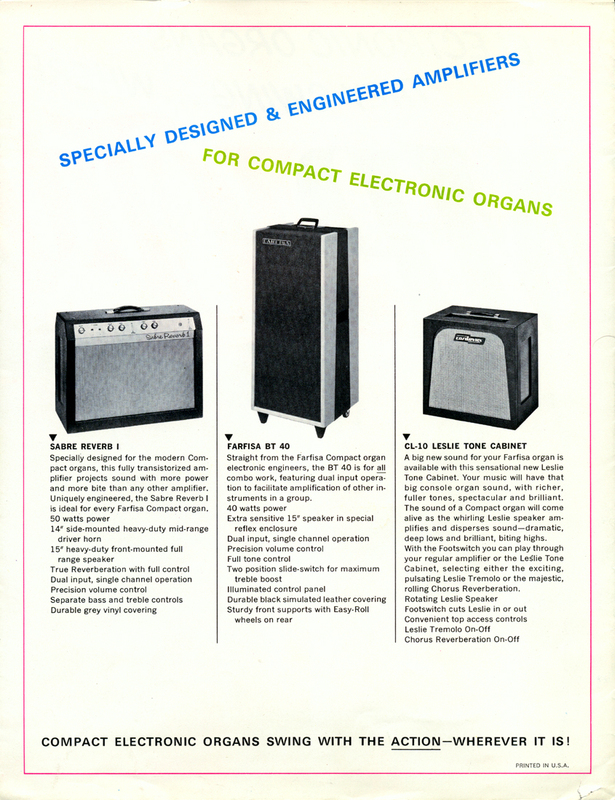 Just like the Gibson organs, and the later Cordovox organs (also a CMI brand) were very similar to Farfisa organs, the later Farfisa branded amps were most likely made by Gibson. Also, the Maestro effects were in there somewhere too. This 50 watt amp boasted at 15″ speaker and a side mounted 14″ heavy duty mid range driver horn. This beast was designed to fill up the room with sound and help emulate a larger than life organ. Specially designed for the modern Compact organs, this fully transistorized amplifier projects sound with more power and more bite than any other amplifier. Uniquely engineered, the Sanbre Reverb I is ideal for every Farfisa Compact organ. Straight from the Farfisa Compact organ electronic engineers, the BT 40 is for all combo work, featuring dual input operation to facilitate amplification of other instruments of the group. A big new sound for your Farfisa organ is available with this sensational new Leslie Tone Cabinet. Your music will have that big console organ sound, with richer, fuller tones, spectacular and brilliant. The sound of a Compact organ will come alive as the whirling Leslie speaker amplifies and disperses sound – dramatic, deep lows, and brilliant, biting highs. With the Footswitch you can play through your regular amplifier or the Leslie Tone Cabinet, selecting either the exciting, pulsating Leslie Tremolo or the majestic, rolling Chorus Reverberation. Compact Electronic Organs Swing With The Action – Wherever It Is!